Use your PayPal account OR use any credit card if you have no PayPal account. Join/Renew online by selecting the membership options you wish, above. 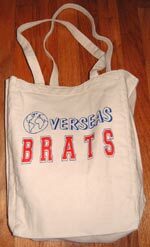 Since 1986 thousands of those connected with our special heritage have enjoyed being a part of OVERSEAS BRATS and receiving our publication. *Three editions each year, a bumper sticker and a free 30 word ad. For those who are joining, you’ll be sent some past editions immediately! Cost is just $20 a year or $35 for two years. *A biographical sketch of yourself in one of the publications. 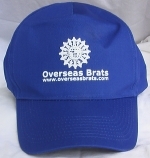 You specify a ‘gift’ membership ($125 or more) and OVERSEAS BRATS will come up with a multi-year membership/gift package designed just for YOU and a one year Option A package to someone you designate. At $500 you will enjoy the benefits of SPECIAL GIFT CATEFORY for the rest or either yours or that of the life of OVERSEAS BRATS (founded in 1986). Available in Medium, Large, Extra Large. 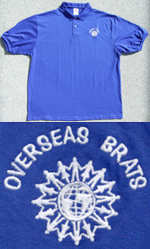 Dark blue short- sleeved golf shirt with the OVERSEAS BRATS logo embroidered in white, 50% pre-shrunk cotton and 50% polys-ter. Available in medium, large and extra large sizes. Cost includes shipping and handling. Available in Medium, Large, Extra Large. A handy reminder to showcase your special heritage! Approx 1-3/8" diameter. Cost includes a plastic case, shipping and handling.